ELF evolution 700 STI10W-40 - semi-synthetic engine oil for gasoline and diesel engines ELF 700 STI 10W-40 is the latest generation semi-synthetic multigrade engine oil, paired with specially selected synthetic base oils and minerals and additives. 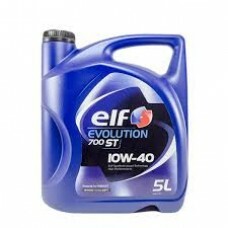 ST ELF 10W40 is recommended for use in gasoline and diesel of the latest design: multi-valve, naturally aspirated and turbocharged, with overhead camshafts, exhaust catalyst, or without, powered by leaded petrol and unleaded. It can be used in urban driving and the highway at high speed in cars and vans used in the harshest conditions. Especially recommended for engines fueled with propane-butane.